TOPIC LIKE THIS has me procrastinating like crazy. I am so underqualified here! But, then again, the majority of Catholics concerned about Church Music are underqualified, like myself. I’d say only a very tiny fraction are Directors of Music, and even those are often held back by the default view that music be accessible and modern. Much of the prevailing advice is directed to those in charge, be they choir directors or priests. It certainly does help if these people encourage good music, but if this isn’t happening then do not despair. Another line of attack is to introduce Church Music in the home. Schools are another great place, if you have the chance. There may be less resistance, less political opposition and a chance to learn and grow. When I was about 18, the opportunity arose to attend a Latin Mass. The choir sang beautifully, but it would bug me that I had no idea what they were singing. About the same time I found a program to type up Gregorian chant. I was typing up music for an after school catechism class. 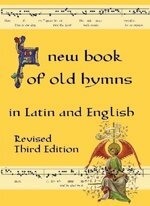 After a few hymns, I decided to collect them together, and so A New Book Of Old Hymns was begun. It is ten years ago now since the first edition. Over the years it has been refined bit by bit. Illustrations have been added. Any gaps have been filled with extra hymns. I began the book with a prayer for the Pope – first Pope St John Paul II, then Pope Benedict XVI. Now I need to update to Pope Francis! While I am working on the update, if you have any other suggestions, the comments box is open. When I mentioned this topic to my husband, he suggested Soft Catholic Mass Quiet Toys. That pretty much sums up our contribution to good liturgy – we do what we can to keep the peace in the back pew. A ball of yarn is another handy resource – possibilities for very clean, quiet mess.